Mindfulness means being aware in the present moment, disentangled from thoughts or emotions about the past or future. Everyone has the capacity to be mindful. But, due to habit, we lose ourselves in thoughts, emotions, sensations, and the whirl of life around us. Often, our thoughts and emotions lead to stress as we respond to internal triggers or external circumstances. Anger when passed over for a promotion at work. Anxiety about performance in any area of life. Doubts about your personal value as a human being. Need for validation from others. Confusion about what to do next. Obsessing about whether he or she really loves you. Mindfulness helps you let go of troublesome thoughts and negative emotions. In the process, stress begins to naturally dissipate. There are many physical triggers that can set off the stress response too like a loud, unexpected noise, commuting in dense traffic, or chronic pain. Mindfulness can help you build your resilience to physical stressors like these. It can also enable you to change your perception of them so you feel less stress. In essence, mindfulness can help you interrupt and turn around the biochemical cascade of stress that’s triggered all too frequently in modern life. And, that means more joy, peace and freedom. Since “mindfulness” became a buzz word after being featured in Time Magazine, there’s confusion floating about as to what mindfulness really is. People use the word "mindful" in a generic sense, but the most effective approach to mindfulness is more precise. A static state of peace. Many of us long for a moment of quiet relief and thus may mistake a silent mind as the goal of mindfulness. With time and practice, you’ll experience more moments of calm for sure. But, mindfulness is not a continual state of peace devoid of thoughts or emotions. True peace occurs when your mind is no longer perturbed by whatever arises. The feeling of peace is nice, of course, but you won’t cling to it. Nor will you feed aversion when a thought or difficult circumstance arises. The blocking or suppressing of emotions. Mindfulness will enable you to be aware of emotions as they occur and learn to release them like clouds passing in the sky. Gradually, the practice of mindfulness allows old hurts, confusion, and stuck patterns to move up to the surface where they can be liberated and thus no longer confine your life. Mindfulness is not concentrating so hard on one object that you lose touch with everything else around you. Some people promote being in the “zone,” but this is not necessarily mindfulness. When you formally practice mindfulness, you place your bare awareness on an object like the breath or a form, but you can still hear the leaves rustling in the wind and the house creaking. You can feel your heart beating or a trickle of sweat meandering down your face on an especially hot day. Your senses remain open and alive, not shut down like a corpse. You may experience the absence of thoughts for short periods of time, but mindfulness is not the permanent absence of thoughts. That again mistakes mindfulness for being like a cadaver. Thoughts and emotions will continue to arise, but you will no longer engage in elaborate conversations with them. So the mind gradually becomes more serene. Make you more aware of internal and external stressors as they occur. Empower you to recognize your own stress response before it gets out of control. Help you to intervene and regain control when stress has gotten out of hand. Give you the awareness and choice to respond differently when stress occurs. Help you slow down so you can see more options. Give you the opportunity to change the way you perceive a stressor so it will have less impact upon you. Provide a firmer foundation to help you face maladaptive coping mechanisms like overworking, hyperactivity, overeating, and addictions. Settle the mind so peacefulness becomes the new baseline. More than 30 years of medical research has shown that the regular use of mindfulness-based stress reduction techniques is an effective way to diminish stress. In addition, their use as a complement to medical treatment can positively influence a range of conditions such as chronic pain, high blood pressure, skin disorders, gastrointestinal problems, anxiety, depression, and others. Mindfulness is also a powerful catalyst for rewiring the brain. Mindfulness has been shown to strengthen the functioning of the prefrontal cortex of the brain, in short our executive and cognitive functions, which improves our capacity to rewire old habits and build resilience to adversity. The regular practice of mindfulness leads to a more integrated functioning of the brain as well. I've lived a very high stress life as an Executive Director of non-profits and a Fundraising Consultant. I know it's not easy to break away from stress because you can literally become stuck in a biochemical pattern. But, it's possible and life is so much more easy and fun when you do. 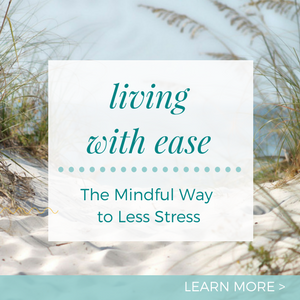 I've brought together my training in mindfulness with my knowledge of stress reduction to create Living with Ease, the Mindful Way to Less Stress, a self-study e-course especially for you. People have said the course has been life-changing for them. If stress is your nemesis, there's a good chance my course will help you too. Because it's now offered in a self-study format, you can start anytime. Learn to confidently avert and dissolve stress. Grow clearer, stronger, and more spacious. At the end of the course, you’ll have a personalized stress reduction program tailored to your own needs, preferences, and lifestyle. The course can be completed in 30 days, but you also have the option of going at your own pace because this is a stress-free zone! If you would like to know more, read the full information page and testimonials: Living with Ease: The Mindful Way to Less Stress. Don't let stress damage your health, destroy your relationships or deflate your joy. Make a commitment now to live with greater ease. Do you practice mindfulness? How does it help you?